The Luminaire Schedule, or Lighting Schedule, is a summary of all the types of lights used in the project. Vital information about each luminaire type is gathered by DraftLogic Electrical from the Luminaire Library database and written into the schedule. DraftLogic Electrical also reports on the exact number of each luminaire type used in the project. Your organization may call this schedule something a bit different, like: fixture schedule or lighting schedule. The entire schedule that you see here is generated completely from scratch for you by DraftLogic Electrical--all you do is pick 'Luminaire Schedule' off a menu or our Report Wizard and say GO--seconds later, you have a complete Luminaire Schedule for your project. The luminaire type codes in the leftmost column of the Luminaire Schedule are completely automatically synchronized with luminaire tags in your floor plan plots (i.e. AutoCAD model space and viewports thereof). No longer do you have to manually track tags down and go through the arduous task of making them match what you have on your Luminaire Schedule! A complete Luminaire Schedule. The luminaires are broken down by category and assigned sequential three digit numbers. In the drawing, the fixture tags are fully automatically synchronized to this numbering system at the same time as the Luminaire Schedule is being generated. user to make comments if desired. The remainder of the columns come from the Luminaire LIbrary expert system database. The Luminaire Schedule provides a completely automated tie to the floor plan using a ‘type’ code, which is a three digit code unique to each different luminaire type used in the project. Types are grouped by their lamp type: fluorescent, incandescent, HID, exit, and LED. The types are listed in order on the Luminaire Schedule & show up as Luminaire Tags near the luminaires in the floor plans. The type code numbers are kept synchronized for you completely automatically by DraftLogic Electrical each time you rerun the Luminaire Schedule, there is nothing you have to do with the luminaire tags other than move any you don't like the placement of. The amount of tags, density of placement, and amount of buffer around each tag are all controlled by you with settings in our project parameters--and you can, of course, place any you want wherever you want manually & DraftLogic Electrical will still keep the type code synchronized for you. on the drawing as shown in the floor plan clip immediatly above. 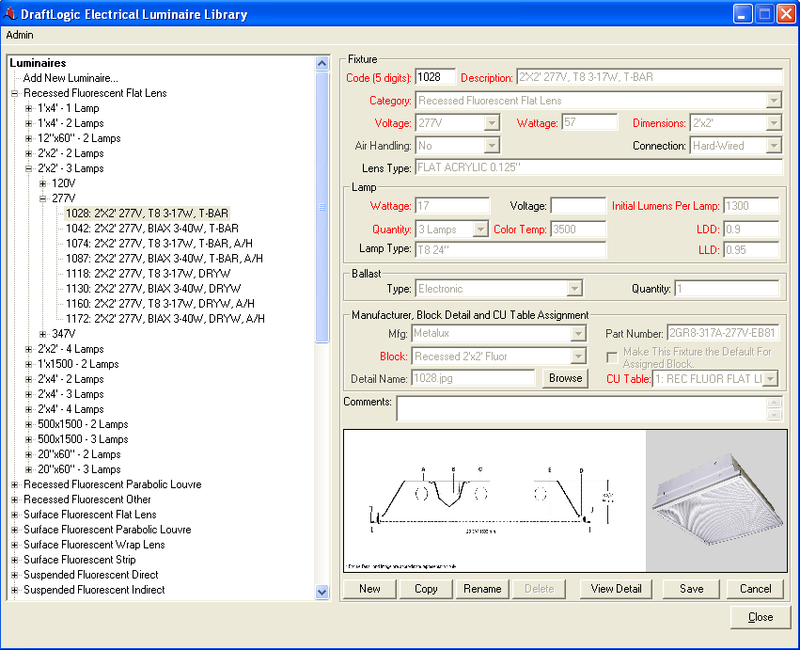 DraftLogic Electrical goes to the Luminaire Library database for all the vital information presented on the Luminaire Schedule: category, description, lamp quantity, lamp wattage, fixture voltage, mounting style, manufacturer, and part number. Above we see a record from the Luminaire Library expert system database. 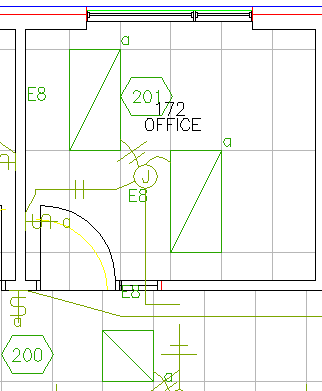 This sample is record #1028, which is the information for the 2'x2' fixtures used in the project that we show the luminaire schedule and floor plan clip above. --easier for your clients to understand and cross reference to the drawing. These same matching fixture type numbers are used in the Luminare Catalogue! The Luminaire Schedule reports exactly what is in the floor plan in seconds. Never any luminaires or values from them missed, never any numbers transposed incorrectly. The client asking for lighting changes more often than you can shake a stick at? No worries, the schedule takes almost no time to update. Rich in detail, the Luminaire Schedule will be perceived as high value by your client, increasing the perceived value of your services. The schedule that is created is built from standard AutoCAD blocks. This means you can scale, rotate, copy & paste, move, modify any values, and even save the Luminaire Schedule out to its own DWG.